We know Alia’s usual style is fun, young and preppy. But what about her traditional fashion choices? 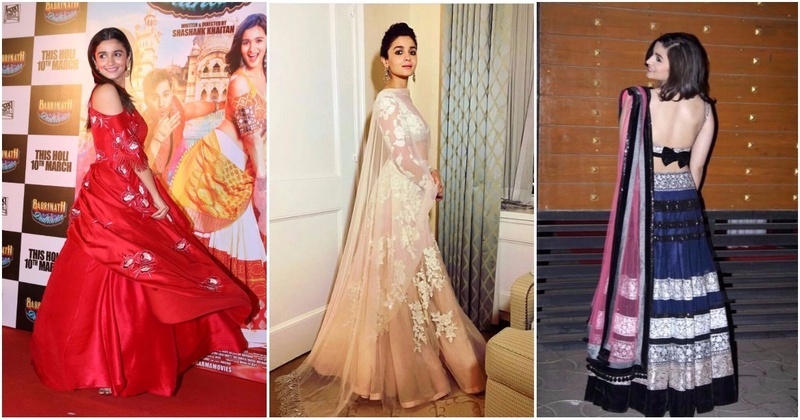 Check out some of Alia Bhatt’s best traditional fashion choices that we’ve put together to give you some amazing inspiration for the festive season! This glittering grey Manish Malhotra saree with a cold-shoulder blouse. This stunning ombre lehenga with white lace. The kitty-prints on this saree are so adorable!! This midnight blue and silver lehenga with a deeep back. Love the bow! A pink lehenga skirt paired with a casual shirt looks pretty cool! A draped kurta set by Tisha Saxena. A baby-pink ensemble with heavy gold work on the shoulder. This white lehenga is so pretty. The silhouette of the jacket only adds to it. Another jacket-lehenga by Anita Dongre.